Ardell Fashion lashes (also known as Ardell Natural Lashes & Ardell Glamour Lashes) are made from sterilized, 100% human hair. These pro-qualitym sturdy strip lashes are reusable and easy-to-apply. Each package comes in a reusable box. Fashion Lashes come in 38 different styles (in beautiful black color lashes for all occasions and hard to find brown natural looking lashes as well for light brown and blondes). Fashion Lashes are sure to have the style that suits you. Click HERE and HERE to view galleries. Update: Change to Ardell Fashion Lashes packaging. New Packaging Ardell Fashion Lashes now says Ardell Glamour Lashes or Ardell Natural Lashes on the cardboard insert. Accessorize your eyes! Instantly get beautiful lush lashes with easy to use Ardell Professional Natural Lashes. Available in a variety of styles from natural day styles to night looks like , you can change your look in a snap. Ardell Natural Lashes--also known as Ardell Fashion Lashes & Ardell InvisiBands Lashes-- (in updated professional packaging) are the fastest way to have long, luscious eyelashes. Try out Ardell Natural Demure. #108, 109, #110 false lashes for everyday glam or Ardell Natural Demi Wispies and Hotties for more eye popping head turn effect. Includes a reusable box for storage when not being worn. Ardell DuraLash Naturals individual eyelashes are the closest thing to natural lashes. They are KNOT FREE, weightless, waterproof, and easy to apply. Each package contains 56 easy to apply individual lashes with no clumsy knots or dark bands. Ardell individual lashes are perfect for filling in sparse areas of your lashline. Also try the NEW Double Individual Lashes lashes for double the volume. Ardell Duralash FLARE individual eyelashes (also known as Ardell Individuals Flare Lashes) are designed for easy application to create lush, natural-looking lashes. They are KNOTTED, weightless, waterproof, and absolutely easy to apply. Each package contains 56 easy to apply individual lash clusters perfect for filling in sparse areas along your lashline. These hand crafted individual lashes are available in regular Knotted Flare and new Double Knotted Flare! Also try our NEW Ardell Duralash Knotted Double Flares Individual Lashes for double the volume per eyelash cluster for instant lush look! Ardell Duralash REGULAR individual eyelashes are designed for easy application. Each package contains 88 easy to apply individual lashes. These lashes have a SINGLE STRIP of lash that is slightly flared. They are permanently curled, weightless, waterproof, and fasten to your own lashes comfortablely. Ardell Eyelash Extension Kits have EVERYTHING YOU NEED to enhancing the length and thickness of your eyelashes. The kits contain all the items required for professionals, lash technicians, or consumer to get started. Ardell Invisibands have an invisible, lightweight band that connects the hair strands to form a strip. Ardell Fashion LashLites are absolutely unique and natural to give you that natural look. Invisibands & LashLites are knotted by hand for perfect uniformity and an absolute natural look. The result is secure corners and unmatched comfort. Double up lashes are the best thing to hit eyes since mascara; these lashes will help achieve the intense dark lashes we crave. The new Double Up Lash innovation combines TWO STYLES IN ONE. The bottom lash adds fullness and the top lash will add flare for an incredibly astonishing lash look for twice the drama, twice the intensity, and twice the fun. ** NEW **. Ardell Elegant Eyes jeweled eyelashes is Ardell's NEW line of lashes. Elegant Eyes faux lashes are just what you need to create glamorous looking lashes with a hint of glitter. Fun, natural looking styles with the added sparkle of elegance. All are guaranteed to attract attention. Ardell Runway Lashes are a High-end cosmetic grade lashes designed for make-up artists. Professionals can use to create beautiful, glamourous runway looks. Ardell Runway lashes have been making a splash among professionals for years, and now they're available for everyone! Used by make-up artists on celebrities and fashion models alike, the Runway Collection is full of alluring, bold, styles perfect for the confident consumer in pursuit of runway worthy lashes. We carry a large assortment of premium, safe and superior lash adhesive selections and gentle adhesive remover for your false eyelashes. Some of our favs are DUO Surgical Adhesive, DUO Eyelash Adhesive, DUO Strip Lash Adhesivem Ardell LashGrip Adhesive, and Ardell LashTite Adhesive; Andrea Modlash Brush-On Adhesive; Ardell LashFree Adhesive Remover and more. Ardell Wispies Lash Collection style lashes are highly textured with criss-crossed pattern to look voluminous throughout. These wispy styles come in many shapes and sizes, from medium length Demi Wispies, to the longer more voluminous Wispies, to ultra glam Ardell Double Up Wispies, to specially designed attention grabbing Ardell Wispies Clusters. Ardell Wispies Collection has a style to accentuate your eyes for noticeable blinks. We carry a full line of easy-to-use Ardell False Eyelashes & Brow accessories to help you achieve the results you're looking for: Ardell Lash Comb, Ardell Lash Curler, Ardell Precision Tweezer, Ardell Lash Applicator, and Individual, Strip Lash Stater kits, Brow Stencils, Brow Trim & Shape, and Brow Powders. Ardell Accents is a collection of HALF (DOLL) LASHES. Half lashes can add and enhanced density along outer edge of your lashline and will change the way you look at faux lashes forever. Accents lashes enhance your look, not by creating new one. 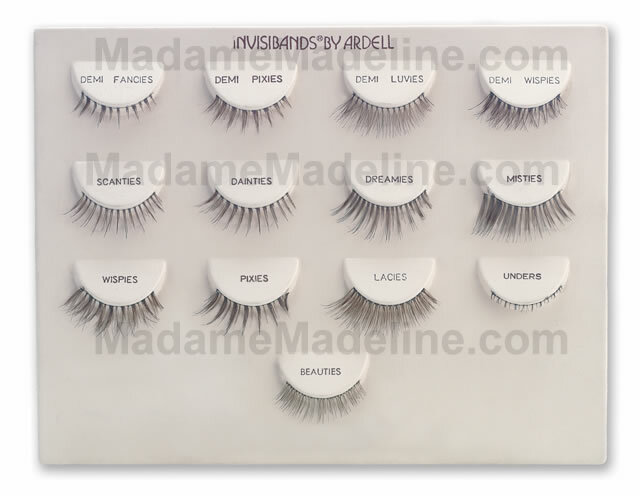 Madame Madeline specialize in meeting our salon's needs by offering LASH Displays to catch your clients' eyes. Also find easy to use professional lash extension products. Please Note, this collection is available for non-U.S. customers only. Ardell Little BLACK Dress is a collection of HALF (PETITE) LASHES available in 4 style combinations designed as eye accents. Half Lashes are ideal for parties, reunions, or an evening out on the town. They are the ideal make-up accessory. Ardell ULTRA Lashes are a high quality eyelash styles and handcrafted using European hair with the professional make up artist in mind. Perfect for that evening out or when looking glamorous is a must, these lashes are just what are needed to help create those SUPER MODEL lashes without the hassle of coats and coats of mascara. Each pack comes with a tube of lash adhesive, an easy-to-use applicator and a pair of lower lashes for added drama, you'll have everything you need to be runway ready! Ardell introduces new line of whisper-soft, ultra dark lashes made of the finest luxurious quality premium Remy human hair! Each lash style features tapered tip ends that naturally blends with your own lashes for a voluminous luxurious look. Ardell Flawless Tapered Luxe Lashes are Rich, ultra black, lush and full for a radiate look from afar! Ardell Double Up Trio Individuals has 2 Trio individual on one band. Double trios have 20 strands per individual cluster compared to 10 strands per cluster in a regular trio. Three double individuals combined onto one lash band for quicker application. Available in short, medium and long trio lash customers, these easy to apply trio individuals are faster and easier method of applying individual lashes for any custom lash looks! From the #1 lash brand loved by celebrities, Ardell Beauty offers makeup artists and beauties around the world with exclusive line of beauty products inspired by backstage beauty. Professional beauty and makeup combine innovative technology advances with exclusive ingredients for heads turn effect you'll love! Ardell Pre-Cut Lashes offer easier lash application and faster customization for lash looks with Ardell’s #1 lash styles Wispies and Demi Wispies. Each Ardell Pre-Cut Wispies, Demi Wispies, 900 and 901 lashes come with 4 pre-cut section which allows you to create your own unique look! Shorter lash segments reduces lifting on the ends of the lash band. Ardell introduces new line of whisper-soft, ultra dark lashes made of the finest luxurious quality premium Remy human hair! Each Remy Lash style deliveres a professional, multidimensional, wide-eyed finish for a voluminous luxurious look. Ardell Remy Lashes are rich, ultra black, lush and full for a radiate look from afar!